Both my children had holiday declared for Maha Shivaratri and I was in a hurry getting ready for the pooja. 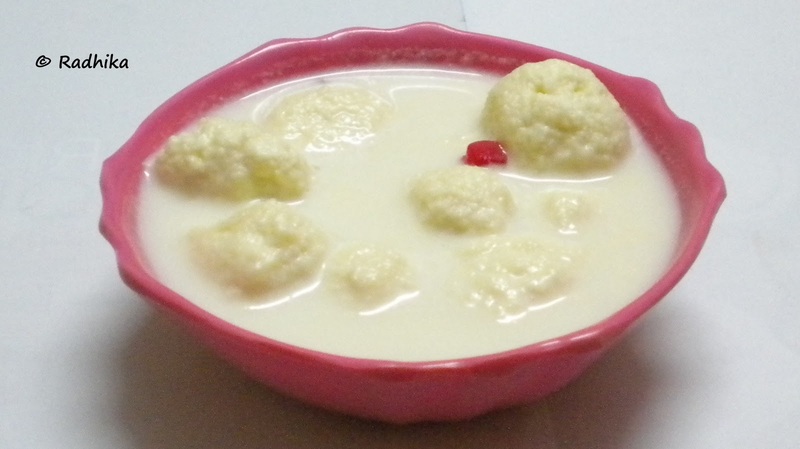 I had already planned on making Paruppu Payasam for Neiveidhyam, when Arjun asked to do something different than the usual stuff. I said that I had no time to prepare for something at the last minute. The little vermin all of a sudden volunteered to help and I couldn’t believe my ears as he is the laziest one in my home and he never volunteers to do any help in any form. So I made him to make the balls. They were so big and he couldn’t make them small. I did not have the heart to chide him over the shape as his interest is what I counted at the time. He enjoyed it so much and I felt so happy that I took the time. I thought of posting this recipe some other time with perfect sized balls but I know that he will feel so happy when I show him the post and so going ahead with the pictures clicked. 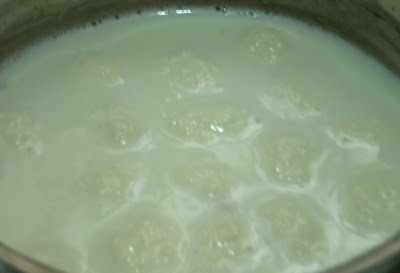 So when you are making this payasam make sure that the balls are smaller than the ones showed in this picture. 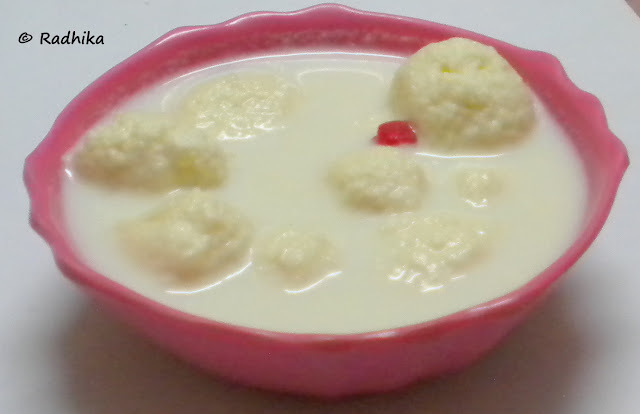 Bring ½ litre of milk to boil and add the lemon juice to curdle it. Once the milk splits pass it over a fine mesh and separate the paneer from the whey water. Knead the paneer softly and make them into small balls. To Make Sugar syrup: Take ¼ cup of sugar in a bowl and add water till the sugar is immersed. Mix it well and switch on the stove and bring it to a boil. No need for any string consistency. Add the paneer balls and cook for another 5 mins over low flame. Bring the other ½ litre of milk to a boil, add condensed milk, mix well and simmer for 10 minutes for the milk to thicken slightly. 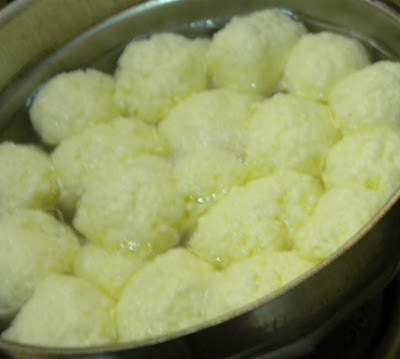 Add the remaining ¼ cup of sugar, cardamom powder and the paneer balls along with sugar syrup and cook for another 5-10 minutes for low flame. Add saara paruppu before serving. Note: you can serve this either hot or cold. If you find your payasam to be watery or if you want to reduce cooking time, crumble 2-3 of the paneer balls and add it to the payasam. I topped my payasam with some Tutti Frutti to add some color. Sadly except for one the others sank. oh wow!! such a lovely looking payasam radhika. And yes please you have to forward them to 15 more if you know or lesser.. upto you, but it is great to share.. thats it. OMG this kheer looks amazing..yummmm!! Looks very tempting and mouth watering !! 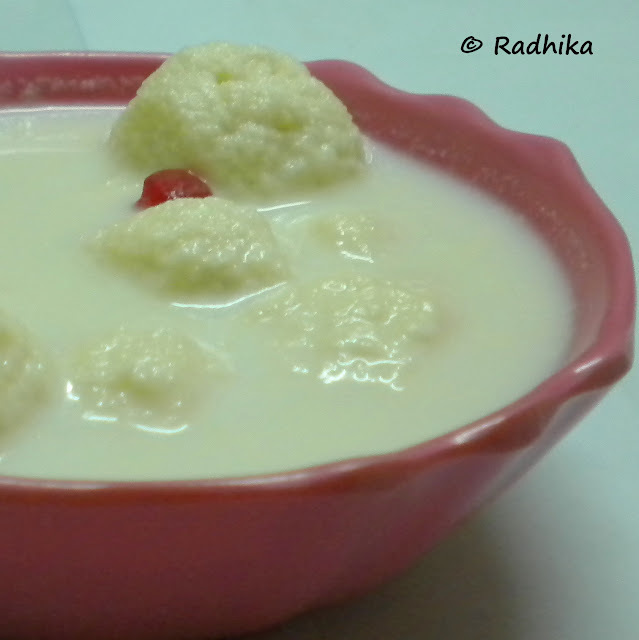 Sounds like an easy version of ras malai! Nice post! tats a amazing kheer. Hv heard abt this but ur version is super good..
Lovely Picture Radhika, looks absolutely mouth watering !